Provided photo The Miami East-MVCTC FFA Chapter recently held its annual Chili Cook-Off Competition. Pictured, left to right, are participants Jacob Sweitzer, Rylee Puthoff, Jeffrey Blackford, Carter Gilbert, Ethin Bendickson, and Michael Bair. CASSTOWN — At the January FFA meeting, the Miami East-MVCTC FFA Chapter held its annual Chili Cook-Off Competition. Members were given the challenge of working in teams or as individuals to create a chili to submit to the judges for evaluation. Winners of the competition included two categories. The Judges’ Choice Winner of the traditional chili was Justin Hawkins and Jacob Sweitzer. Second place went to Rylee Puthoff. First place in the non-traditional chili and winner of the People’s Choice was Carter Gilbert and Jeffrey Blackford for their dessert chili. Second place went to Michael Bair and Ethin Bendickson. All winning teams received an FFA t-Shirt or FFA hat. Judges for the event were the Miami East High School custodial staff Les Kinder, Hannah Ivey, and Sandy Welker, and parents Darla Hawkins and Jackie Winner. 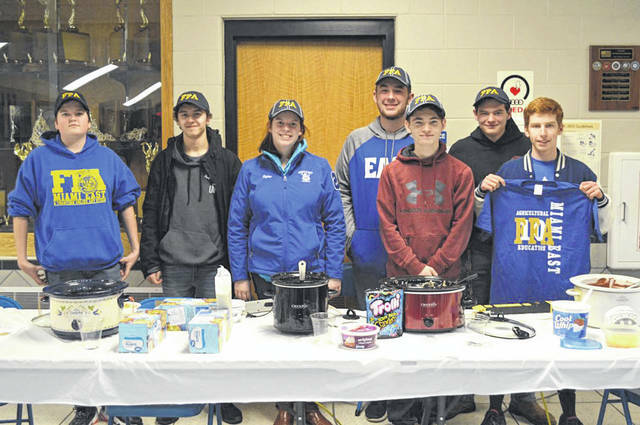 https://www.tdn-net.com/wp-content/uploads/sites/21/2019/01/web1_Chili-Cook-Off.jpgProvided photo The Miami East-MVCTC FFA Chapter recently held its annual Chili Cook-Off Competition. Pictured, left to right, are participants Jacob Sweitzer, Rylee Puthoff, Jeffrey Blackford, Carter Gilbert, Ethin Bendickson, and Michael Bair.